The super speedy 5G mobile internet is close to being rolled out in the UK and is already starting to be used in the US and South Korea. It’s the fifth generation of a mobile network that lets you call, text and get online from your smartphone. The update to 5G will mean there will be much faster data download and upload speeds. There will also be wider coverage and also more stable connections. 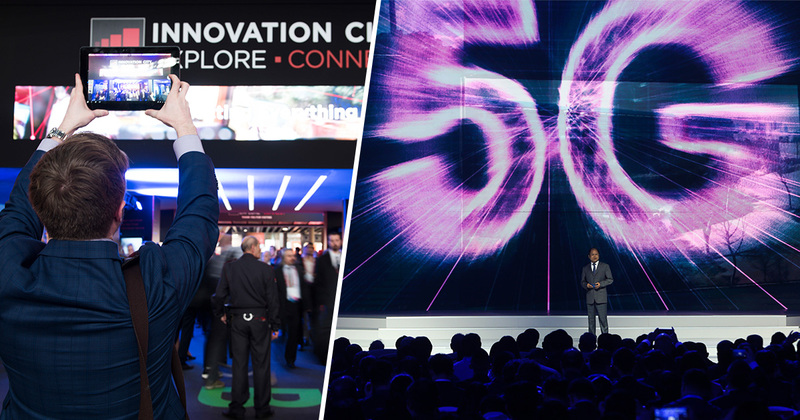 5G smartphones have recently been announced at the Mobile World Congress by Samsung, LG and OnePlus. It won’t be until the network has been properly built and you’ve bought a 5G-compatible smartphone that you’ll probably start to notice the benefits. As well as the benefit of being able to do things faster on smartphones, 5G will help robots, self-driving cars and drones work more effectively. 5G is expected to be able to reach speeds in excess of 1Gbps comfortably, with the ability to hit speeds of 10Gbps eventually. Whatever we do now with our smartphones we’ll be able to do faster and better. Think of smart glasses featuring augmented reality, mobile virtual reality, much higher quality video, the internet of things making cities smarter. But what’s really exciting is all the new services that will be built that we can’t foresee. The possibilities are truly endless with faster connectivity helping us all to be more productive and better connected. Currently, the fastest 4G mobile networks offer around 45 megabits per second. Chipmaker Qualcomm believes that 5G will be able to offer browsing and download speeds 10-20 times faster than 4G. The company claims its Snapdragon X50 5G modem, is designed to achieve up to 5 Gbps in downlink peak data rate. This could mean that we’d be able to download HD films in minutes. With 5G having greater capacity than previous networks, it has access to more and higher frequencies to cope better with many high-demand applications all at once. The world is going mobile and with more data being used than ever before, 5G will be much better at handling thousands of devices using the same networks all at once. It means that speeds won’t be affected by more people being on the network, like what happens when 4G gets congested. With 5G already being rolled out in the US and South Korea in a limited capacity, a UK roll out has already started. According to 5G.co.uk, EE will be launching a 5G network in London, Cardiff, Edinburgh, Belfast, Birmingham and Manchester in the summer. A further 10 cities will get access to the network by the end of the year. Three, Vodafone and 02 have also confirmed they will be building a network before 2019 is done. Across the pond, Verizon has announced plans to launch its 5G service in 30 US cities by the end of 2019. 5G won’t necessarily be able to address issues of lack of signal and low data speeds in rural areas. The technology will firstly be rolled out in densely populated areas to reach as many people as possible. If you live in the middle of nowhere and were hoping your internet was getting faster, you may still be waiting a long time. You will need to buy a 5G-capable phone if you’re going to connect to the network once it’s rolled out. Samsung announced their Galaxy S10 5G smartphone at their unpacked in February. The company is yet to reveal how much the phone is going to cost or when they are planning on releasing it. You can expect the S10 5G and all other devices that support the new network to be incredibly expensive. When the OnePlus 5G smartphone was announced at the Mobile World Congress in February, CEO Pete Lau admitted that the device would be significantly more expensive than models it currently sells on the market. There’s a definite significant cost difference, but we will definitely do our best to control [the pricing] and we’ll keep the device within $1,000. Going above $1,000, the devices become too expensive. Similar prices can be expected to be found across the tech board. If you’re a massive of fan of Apple, you may have to wait a little longer than Android competitors for a 5G smartphone. The company is yet to have announced plans to make a 5G smartphone. When 5G eventually gets rolled out the globe, it will make downloading and uploading data incredibly fast. It’s definitely something to be excited about, even if we are unable to see the finish line just yet.